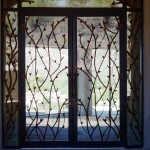 If you’re searching for “Wrought Iron Entry Doors” or “Entry Doors Chandler” we can help you design the best doors for your property, fabricate them, and professionally install them in your business or home. Artistic Alloys & Design specializes in creating everything from the basic to the intricate and wild. 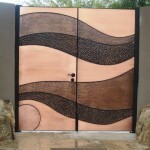 We can help design doors that will capture the essence of your property. The first step is always choosing design inspiration, you can browse our completed projects to find elements you want for your doors and let us know if you have your own design ideas. We will produce a finalized design for your approval and then fabricate your entry doors and install them. 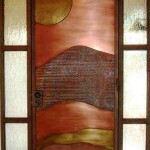 Artistic Alloy clients have the power of choice for their entry doors. You choose if you will have decorative glass elements, custom door pull handles, which type of metal is used, and any custom finishes. 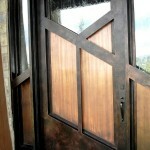 We also work with wood for entry doors with iron or other metal accents. No matter which style you need for your home or business, we can fabricate it! Single entry doors are great for narrow main entryways or side doors. They offer properties visually stunning and stylish elements that welcome your visitors to your property. Double entry doors are a modern necessity as most businesses and homes need to be able to receive larger deliveries of furniture, appliances and other large or bulky items. Glass is a popular option for entry doors as it makes it easy to see who’s arrived and can let natural light into your home. 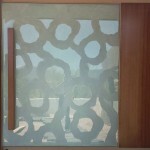 You can choose frosted, decorative, or clear glass. We are happy to be able offer our customers any design of wrought iron from straight bars to metal designs that have geometric designs, and shapes from nature. 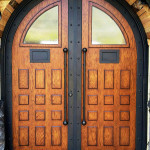 Entry doors in centuries past were made from a combination of heavy wood and iron. We can create stunning traditional or modern interpretations of these iconic entry doors. 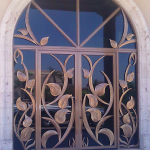 Artistic Alloys LLC is Chandler Arizona’s top fabricator of wrought iron entry doors, custom steel and metal doors for commercial and residential properties. 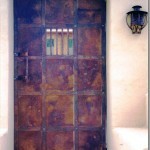 Iron entry doors will increase the value of your property and improve the curb appeal. The entry door is many times the visual focal point of properties which welcome visitors to your home. 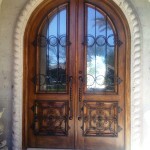 Our team will customize your entry door design to fit your property, personality, and purpose of your property. 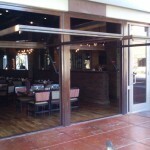 We fabricate everything right here in the Phoenix Valley and will deliver and professionally install it for you. There are several ways entry doors will benefit the businesses and homes they are installed in. 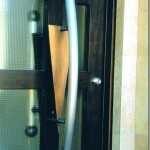 Here are some of the biggest advantages of installing entry doors from Artistic Alloys. Increased Property Value – The addition of our entry doors will do more than just set your home apart, it will increase the value of your property. 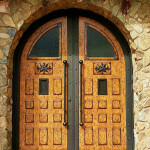 Naturally our doors increase the security of your home, yet they also make your home or business have more curb appeal. Any investment you make in your property helps increase the value and if you should decide to sell it will be worth more. Best of all you get to enjoy your investment for as long as you own the property. Aesthetically Secure – Security has been and always will be a concern at our commercial and residential properties. Our entry doors are designed to be visually stunning yet still pack a punch when it comes to security. Our doors are fabricated with uncompromising dedication to quality and durability. Everything from the doors to hinges are designed to be secure. Career criminals avoid houses that have improved security and seek properties that haven’t invested in better doors. Customized Durability – The visually stunning designs we fabricated are designed to last the test of time. Everything we fabricate is done to improve your home for many years to come. Iron and other metals used to fabricate your entry doors are made from the highest quality raw materials and welded to the highest standards. 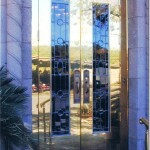 Our entry doors are designed for Arizona and the intense heat we experience here. That means the doors we build are meant to be permanent additions to your business or home. Old World Character – If you’re wanting a timeless and old world feel we can create designs that include the heavy iron look that was popular during the middle ages. This captures the old world feel and will also include wood panels, oversized hinges, and large metal rivets that were common in the time period. Many time these doors were also arched to match stonework. These doors were good enough to help protect during these ages and with modern fabrication they will be even and even more imposing addition of security. Rustic Charm – If you want to enjoy inspiration from the deep woods, high mountains, or secluded cabins in your entry doors, we can help! Many of the rustic door styles will take inspiration from nature and include leaves, vines, and flowers. Our mastery of metalworking allows us to create one of a kind natural details that will appoint your home with unmistakable style that stuns your visitors. Classical Posts – Embellished horizontal and vertical bars along with windows are synonymous with classical style entry doors. You can customize your style by choosing custom spacing, orientation, custom embellishments, and the size of the bars you choose for your entry doors. You can also customize the look with how many bards and if there is a window in the design. Modern Mystique – While traditional entry doors have straight bars, loops, and swirls common in their style, modern design elements include rectangles, squares, circles, and other geometric patterns which can be nestled in and around each other to create stunning modern entry doors. These new designs emphasis new modern style yet are always fabricated to be just as durable and secure as traditional styles. 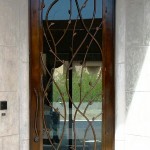 Artistic Alloys & Design will help you create a custom entry door design and install it at your home or business.